The Gospel of Mark, Chapter 5: Where’s the Delete Key? It’s too bad J. K. Rowling didn’t write the gospels. 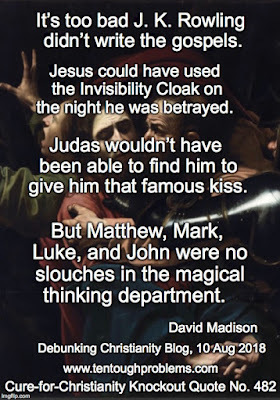 Jesus could have used the Invisibility Cloak on the night he was betrayed; Judas wouldn’t have been able to find him to give him that famous kiss. 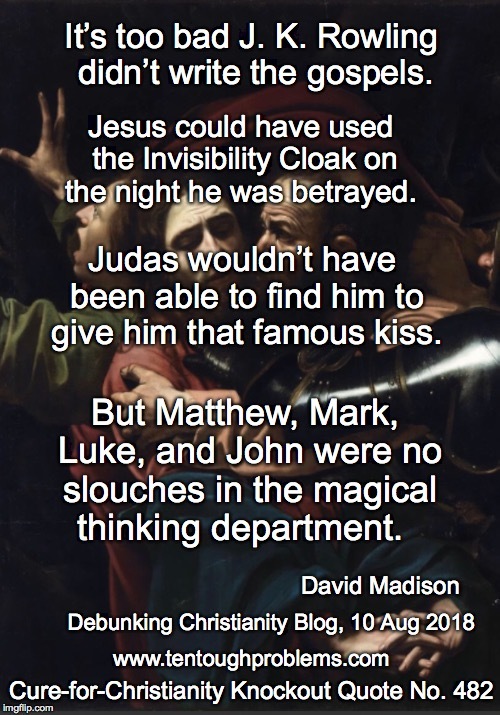 But the four guys who penned the most famous Jesus stories—whom later tradition named Matthew, Mark, Luke, and John—were no slouches in the magical thinking department. One of the mysteries of the Christian faith is that devout folks don’t notice this, or don’t grasp it; or, in explicably, they’re just not too concerned about it. Some evangelicals are tuned in enough to be alarmed by the Harry Potter stories—it’s sorcery, after all—without noticing the irony: Harry is competition; they trade in the same genre. For a little fun comparing the Jesus stories and J. K. Rowling’s hero, see Derek Murphy’s Jesus Potter Harry Christ: The Fascinating Parallels Between Two of the World’s Most Popular Literary Figures. I suppose Christians are willing to give a pass to magical thinking when it is embedded in charming, touching stories—or one with ominous qualities, which is what we find in Mark 5. Still, this is no excuse to abandon critical thinking. Just what kind of literature is this? This is another in my series of articles on Mark’s gospel, one on each chapter. The Introductory article, “Getting the Gospels Off on the Wrong Foot,” is here. My comments on Chapter 4 are here. When word of this got around, Jesus was asked to leave the area; he voiced no remorse for the huge loss of livestock, or for wiping out the livelihood of the herdsmen. What was Mark up to with this story? If he was a novelist, creating a protagonist according to his whim, guided by his concept of Jesus and his understanding of how the world works—which included the presence of sinister demons—then this is a darn good story. But Christians are inclined to position the gospel as honest-to-goodness Jesus biography; chapter 5 is what happened to Jesus one day. So, no one was lying: Jesus chatted with demons. What kind of compromises with reality are Christians willing to make? It has taken a long time for humans to get up to speed on causation: what causes things to happen? And it would seem that a lot of believers aren’t up to speed yet; just this week a California pastor blamed gay marriage for the fires blasting the landscape. Natural disasters and other misfortunes have long been considered the work of angry gods. And it’s no surprise that mental illness—the derangement that afflicted the man in Mark 5—was considered demon possession. But we know better, right? To Christianity’s shame, the faux modernist pope Francis encourages such delusional thinking. The Vatican trains exorcists. So we can assume that many Christians are willing to look at this story and give it a nod, “Yes, Mark got it right.” But that requires buying into all the nonsense that goes along with it—if you take the story at face value. Unlike any Galilean man on the street who ran into Jesus, the demons knew right away that Jesus was the son of God. Moreover, Jesus spoke to the demons, not to the man himself. And since he had much higher ranking in the spiritual world, he could boss them around. We read that he “gave them permission” to enter the swine, but we’re not told if this was by voice command, gesture…or magic wand. Mark fails as a biographer, which wasn’t his intent in any case; energized by theology, he has crafted religious fantasy literature, and this episode illustrates the sweep of his magical thinking. And he’s not done yet. Let’s try to escape sentimental piety long enough to unpack this episode. Folklore thrives on magical thinking: No, diseases aren’t healed by ‘power’ flowing from a holy man to an afflicted person. In this case, it was merely touching Jesus’ garment that did the trick. We expect as much in the Harry Potter books and Disney movies. But pay attention, folks, it’s right there in the Bible too. “Oh, but with Jesus it was real.” Give me a break. It’s not to be taken seriously. Moreover, Jesus deserves demerits, as do all cult fanatics, for praising faith as a technique for getting along in the world. Religion was invented—so goes an old wisecrack—“when the first con man met the first fool.” The con man knows, through experience dealing with fools, that very few people know how confirmation bias works. If just a few of the things they wish for—or pray for—come true, Wow! They rejoice that faith and prayer work. In this case, of course, the storyteller makes the tale come out right: the woman was healed instantly. He’s playing to his audience. Okay, maybe this is hyperbole or metaphor, but it can be destructive nonetheless. Believers tune in to the high expectations, and when they fail to measure up can descend into grief and despair: their faith and prayers weren’t strong enough when needed the most, e.g., to keep a baby from dying—and a thousand other tragedies their faith couldn’t ameliorate. By voice and touch, the magician eliminated the malady, whatever it may have been. Mark’s fondness for the word “immediately” has long been noted. He uses it repeatedly in the gospel to heighten drama; here he wants his readers to appreciate the swift power of Jesus’ magical touch. And his advice to the father, “Do not fear, only believe,” is the common mantra of religious zealots. In my article on Mark 4, I pointed out that Mark’s target audience was the early Jesus cult, hence there is no surprise in stressing the importance of belief: cults don’t survive without it. There is no surprise at all about his quick happy ending. He is always playing to his audience. Mark chapter 5 can be removed from any list of gospel chapters that might yield hard facts about Jesus. Yes, hit the delete key. Mark wrote theology to promote the Jesus cult; he was a propagandist—as were all the gospel writers. These realities always must be stressed: he probably wrote some 40 to 50 years after the ‘events’ he reports; we do not know his sources; we do not know where these stories came from, in this case, the deranged man, the woman with chronic hemorrhaging, and Jairus’ daughter. Pious scholars indulge in wishful thinking that reliable oral tradition or eyewitness reports reached Mark—with nothing to back that up, and with tremendous odds against it. When magical thinking is such a prominent feature of the stories, we can be pretty sure we’re dealing with folklore. Apologists can rush to the defense of Mark 5, insisting that ‘great spiritual truths’ are conveyed by stories that can be appreciated as symbols or metaphors—but without confessing out loud that the stories are make-believe.